opts = hsvdOptions returns the default options for the hsvd and balreal commands. opts = hsvdOptions(Name,Value) returns an options set with the options specified by one or more Name,Value pair arguments. Specify comma-separated pairs of Name,Value arguments. Name is the argument name and Value is the corresponding value. Name must appear inside single quotes (' '). You can specify several name and value pair arguments in any order as Name1,Value1,...,NameN,ValueN. To restrict the computation to the range between 3 rad/s and 15 rad/s, assuming the frequency unit of the model is rad/s, set FreqIntervals to [3 15]. To restrict the computation to two frequency intervals, 3-15 rad/s and 40-60 rad/s, use [3 15; 40 60]. To specify all frequencies below a cutoff frequency fcut, use [0 fcut]. To specify all frequencies above the cutoff, use [fcut Inf] in continuous time, or [fcut pi/Ts] in discrete time, where Ts is the sample time of the model. The default value, , imposes no frequency limitation and is equivalent to [0 Inf] in continuous time or [0 pi/Ts] in discrete time. However, if you specify a TimeIntervals value other than , then this limit overrides FreqIntervals = . If you specify both a TimeIntervals value and a FreqIntervals value, then the computation uses the union of these intervals. To restrict the computation to the range between 3 s and 15 s, assuming the time unit of the model is seconds, set TimeIntervals to [3 15]. To restrict the computation to two time intervals, 3-15 s and 40-60 s, use [3 15; 40 60]. To specify all times from zero up to a cutoff time tcut, use [0 tcut]. To specify all times after the cutoff, use [tcut Inf]. The default value, , imposes no time limitation and is equivalent to [0 Inf]. However, if you specify a FreqIntervals value other than , then this limit overrides Timeintervals = . If you specify both a TimeIntervals value and a FreqIntervals value, then the computation uses the union of these intervals. Absolute and relative error tolerance for stable/unstable decomposition. Positive scalar values. For an input model G with unstable poles, hsvd and balreal first extract the stable dynamics by computing the stable/unstable decomposition G → GS + GU. 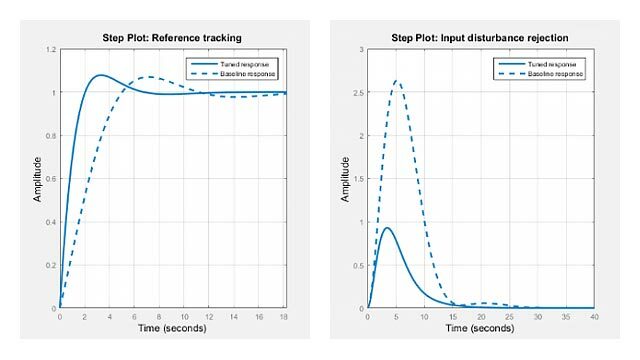 The AbsTol and RelTol tolerances control the accuracy of this decomposition by ensuring that the frequency responses of G and GS + GU differ by no more than AbsTol + RelTol*abs(G). Increasing these tolerances helps separate nearby stable and unstable modes at the expense of accuracy. See stabsep for more information. Increase the value of Offset to treat poles close to the stability boundary as unstable. For additional information on the options and how they affect the calculation, see hsvd. The time-limited and frequency-limited state contributions are calculated using the time-limited and frequency-limited controllability and observability Gramians, as described in gram and in . Use the Offset option to force hsvd to exclude the pole at s=10-6 from the stable term of the stable/unstable decomposition. The plot shows that one state is treated as unstable. hsvd computes the energy contributions of the stable states only. Compute the Hankel singular values of a model with low-frequency and high-frequency dynamics. Focus the calculation on the high-frequency modes. 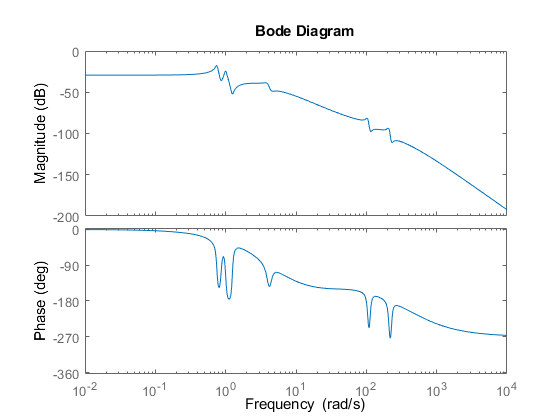 Load the model and examine its frequency response. Gms has two sets of resonances, one at relatively low frequency and the other at relatively high frequency. Compute the Hankel singular values of the high-frequency modes, excluding the energy contributions to the low-frequency dynamics. To do so, use hsvdOptions to specify a frequency interval above 30 rad/s. Gawronski, W. and J.N. Juang. “Model Reduction in Limited Time and Frequency Intervals.” International Journal of Systems Science. Vol. 21, Number 2, 1990, pp. 349–376.